Curtis started out in college as a running back at the Univ. of California, where he was also a track star, but controversy that led to NCAA sanctions against the school caused him to transfer to San Diego State as a senior. Curtis had an outstanding year at wide receiver for the 10-1 Aztecs under the guidance of Head Coach Don Coryell, catching 44 passes for 832 yards (18.9 avg.) and seven touchdowns. 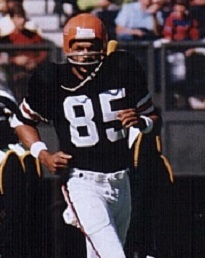 He received first-team All-Pacific Coast Athletic Association honors and was chosen by the Bengals in the first round of the 1973 NFL draft (15th overall). Curtis moved directly into the starting lineup and developed into a stellar performer over the course of the season. Bengals went 10-4 to finish first in the AFC Central. Lost AFC Divisional playoff to Miami Dolphins (34-16). Curtis was selected to the Pro Bowl in each of the next three seasons and was regarded as one of the league’s more potent deep threats at a time when teams were less inclined to go to the air. While his catches dropped to 30 in 1974, 10 were for touchdowns, and he led the NFL by averaging 21.2 yards on 44 receptions in ’75. Curtis lost half of the 1977 season due to knee surgery but bounced back to catch a career-high 47 passes in ’78, although his average dropped to 15.7 and only three were for TDs. He remained with the Bengals until 1984 and, while no longer an elite receiver, was still capable of making big plays. Overall, Curtis caught 416 passes for 7101 yards (17.1 avg.) and 53 touchdowns. He received first- or second-team All-NFL honors three times, first-team All-AFC recognition after five seasons, and was selected to four Pro Bowls.